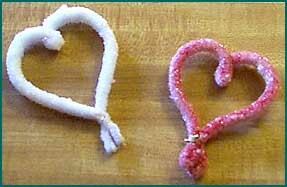 You can make beautiful ornaments using pipe cleaners and Borax for just about any holiday. These make great gifts, tree ornaments, kitchen magnets, or package decorations! Shape the pipe cleaners any way you want. For the project shown here, we made hearts for Valentine's Day but you can make any shape you want... angels, stars, fs, etc. In a wide mouth container (wide enough to hang your ornament in so it doesn't touch the bottom or sides), pour boiling water. Add about a cup of borax, less or more depending on the size of your container and the amount of water. A thick glass container works well, because you can see the Borax dissolving. Add enough Borax so the water is quite cloudy. Suspend the ornament in the solution: tie a piece of string or yarn to it, tie the other end of the string to a pencil, and then lay the pencil across the top of your container. Make sure the pipe cleaner is completely immersed in the solution and isn't touching the sides or bottom of the container. As the solution cools, the crystals will begin to form on your pipe cleaner. Leave overnight. Remove from the solution and allow to dry. Note: Overnight soaking will give you very thickly crystallized ornaments. If you want some of the color of the pipe cleaner to show through, leave in the solution for less time. 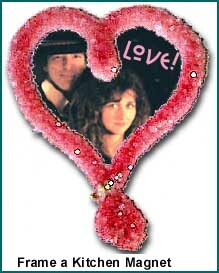 The red pipe cleaner heart shown on this page was left in for 2 hours. If you want, you can spray your finished ornament with acrylic sealer or clear spray paint to keep the crystals from falling off too quickly. Glue to cardboard backing to make a photo frame. (Shown at left.) Attach a strong magnet (the ornament is heavier than most kitchen magnets) to the back.